On June 28, 1919, the Treaty of Versailles was signed at the Palace of Versailles outside Paris, France. 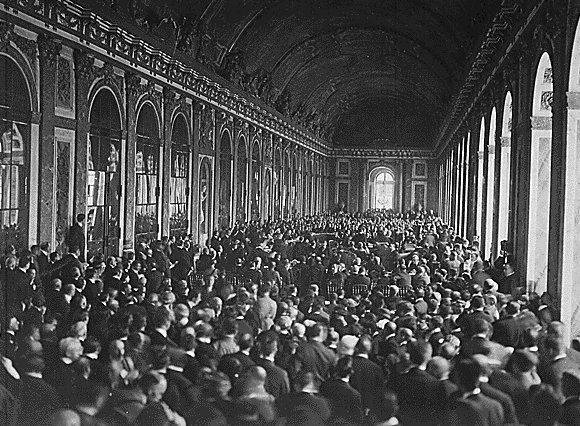 Delegates signed the Treaty of Versailles in the former palace's famous Hall of Mirrors, ending World War I. On June 28, 1919, the Treaty of Versailles was signed at the Palace of Versailles outside Paris, France. The treaty was one of several that officially ended five years of conflict known as the Great War—World War I. The Treaty of Versailles outlined the conditions of peace between Germany and the victorious Allies, led by the United States, France, and the United Kingdom. Other Central Powers (significantly, Austria-Hungary) signed different treaties with the Allies. The Treaty of Versailles is one of the most controversial armistice treaties in history. The treaty’s so-called “war guilt” clause forced Germany and other Central Powers to take all the blame for World War I. This meant a loss of territories, reduction in military forces, and reparation payments to Allied powers. Some historians think the Treaty of Versailles was, in the words of British economist John Maynard Keynes, “one of the most serious acts of political unwisdom for which our statesmen have ever been responsible.” They say it contributed to German economic and political instability that allowed for the formation of the National Socialists (Nazis) just a year later. Other historians note that the Treaty of Versailles was actually very restrained—Germany and other Central Powers were not occupied by Allied forces after the war, and a reduction in military spending meant they could afford the reparation payments. The treaty was also much more lenient than the armistice treaty (the Treaty of Brest-Litovsk) Germany forced on Russia when that nation negotiated an exit from the war a year earlier. alliance of countries that participated in World War I: the German Empire, the Austro-Hungarian Empire, the Ottoman Empire, and the Kingdom of Bulgaria. Also called the Triple Alliance.